The last story I have out of Nepal (at least for now) is my biggest tale, at least in terms of my focus and efforts over the last year. 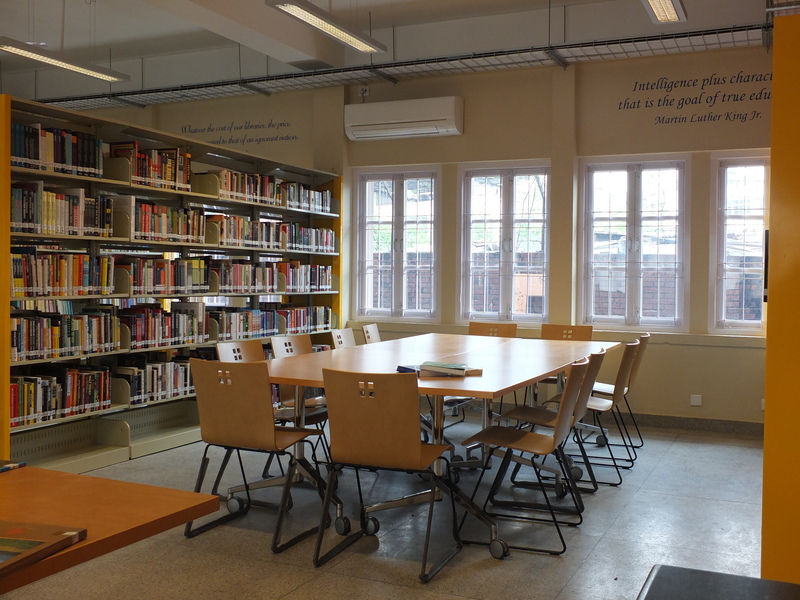 The U.S. State Department has opened American libraries all over the world and Nepal we already had about six, plus the Book Bus and a seventh library inside the U.S. Embassy in Kathmandu. 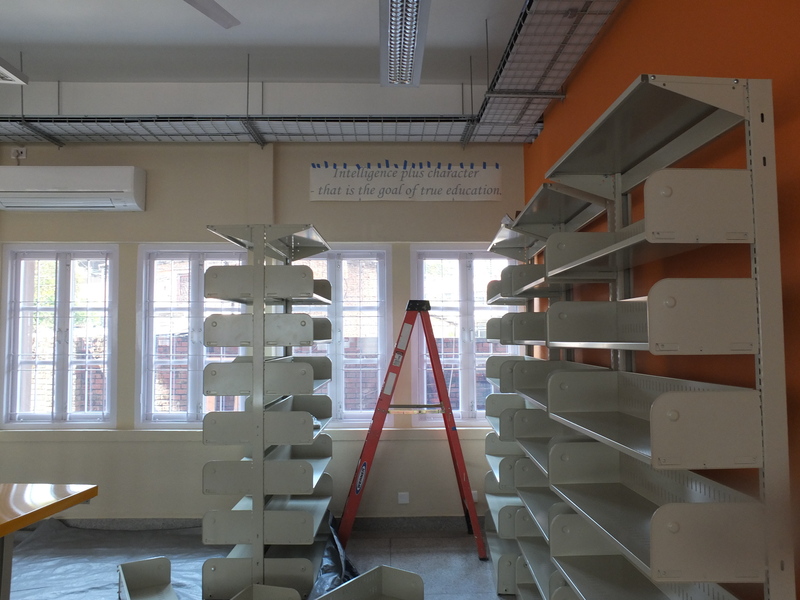 But that space is small and security is tight, and the potential was there for a second Kathmandu site that could handle more outreach programs and deliver books to underserved communities on the other side of the city. As it turned out the timing of the opening was better than planned, as it came at a time when the few libraries that exist in the city were devastated by the earthquake. 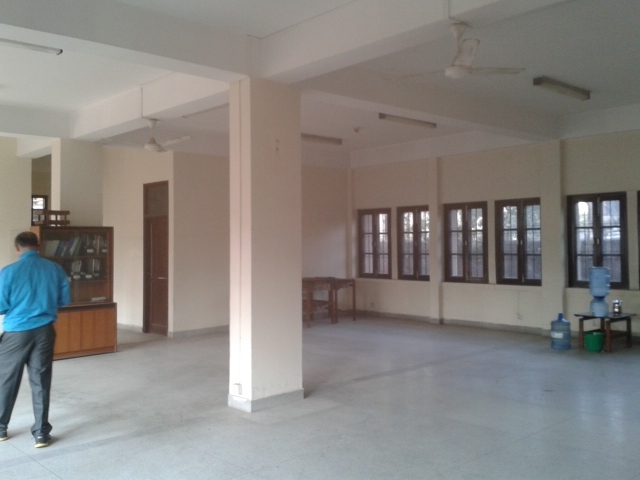 Public libraries in Nepal are rare. Most schools don’t have them either, or only have a small selection of text books that are kept under lock and key. Lending libraries are even rarer. 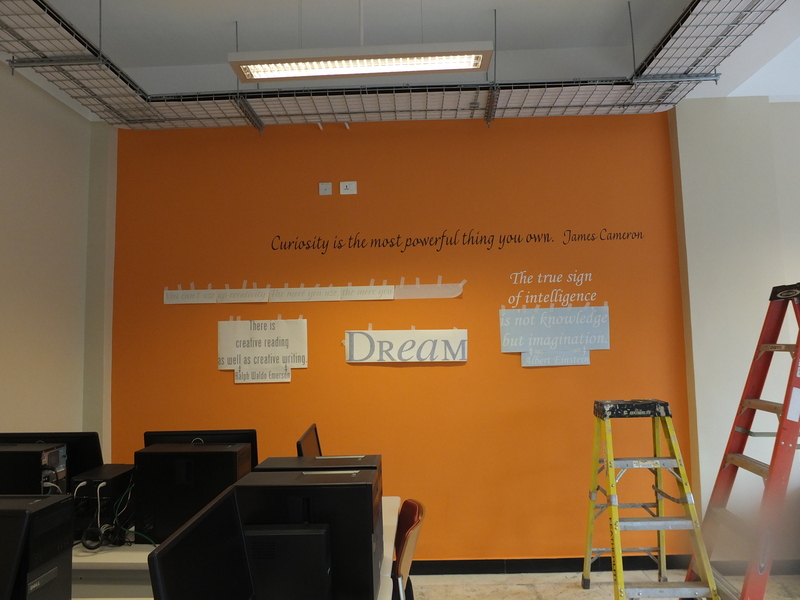 The plan to lend books out from the new space was often met with incredulity as people simply couldn’t believe that anyone would ever return them. 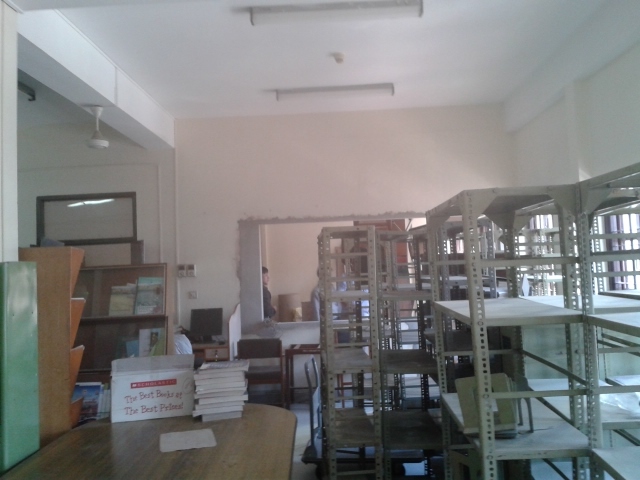 Nepal libraries are usually reference centers and still only about books. 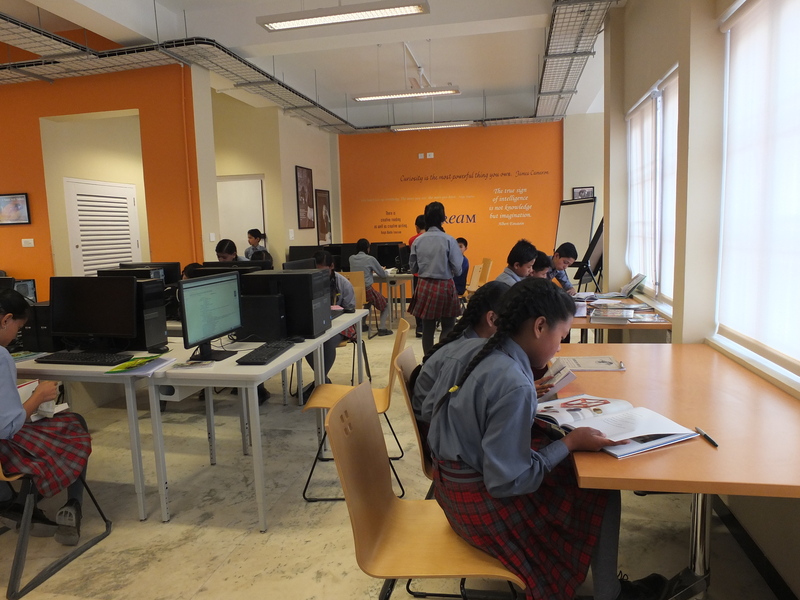 American Spaces are more multi-media center with computers and electronic resources and, although Nepal mainstream is not really ready for new technology, the need is growing, and the new Innovation Hub will be at the forefront. Its very exciting, I’m just sad that I won’t be in Nepal to see it grow. It was a fantastic project opportunity, which was challenging to handle as it was educational for me, as I’m not a librarian. With the help of a small army–and despite a major earthquake– I managed to open it before I left. I’ll be keeping an enthusiastic online eye on its growth! 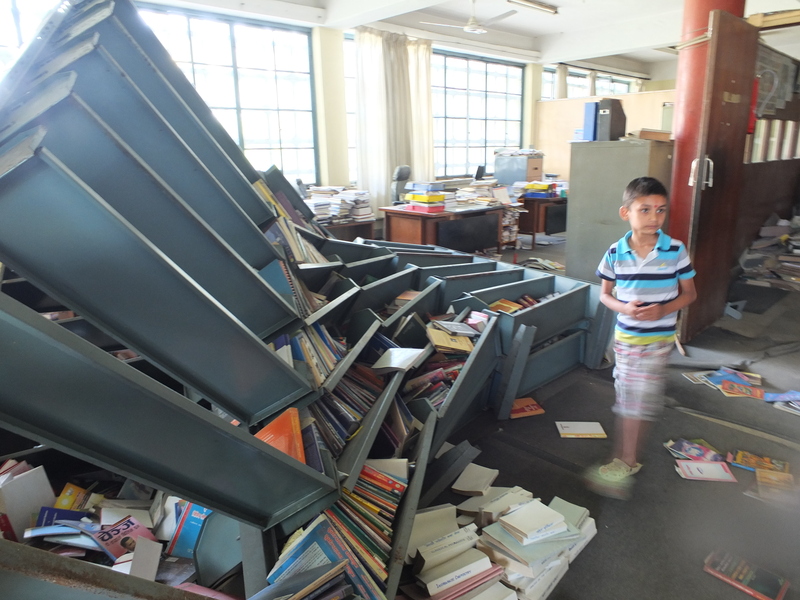 The earthquake-wrecked library at Tribuhavan University. Very Sad. None of the bookshelves were bolted down. 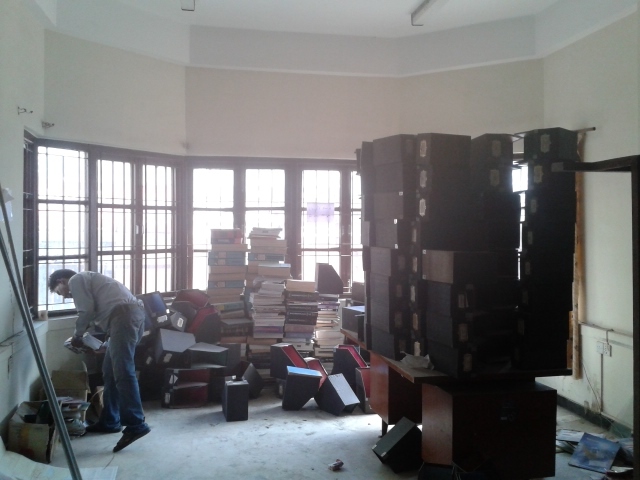 The original space before we started: Books covered with quilts of dust; broken shelving units; old paper card index systems; spider-web covered windows. 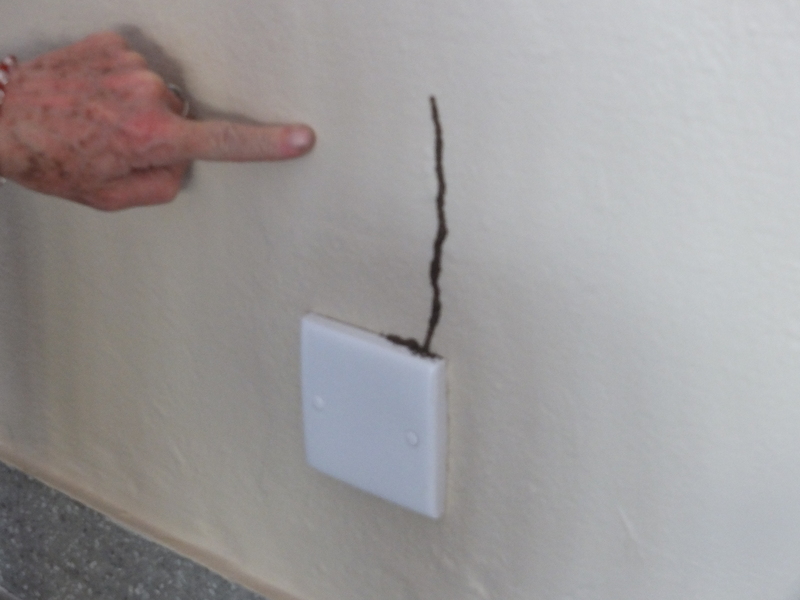 This corner also had termites. The librarians worked to clear the space and it slowly started to clear out. As the space opened up, the windows started to become more of a focus. They gave great light and the promise of a bright, open space. After the electricans had finished, we started to focus on a colour scheme. 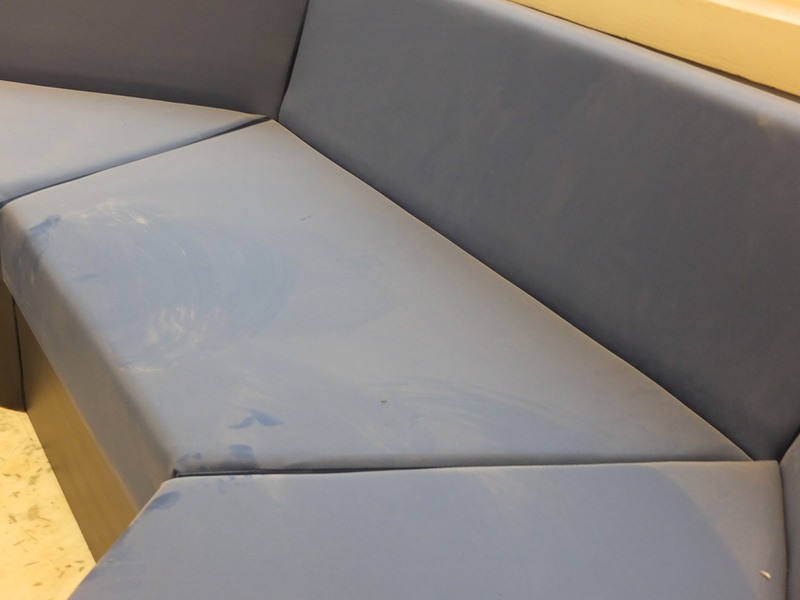 Custom built furniture was erroneously delivered two months early and had to be removed – that was fun! 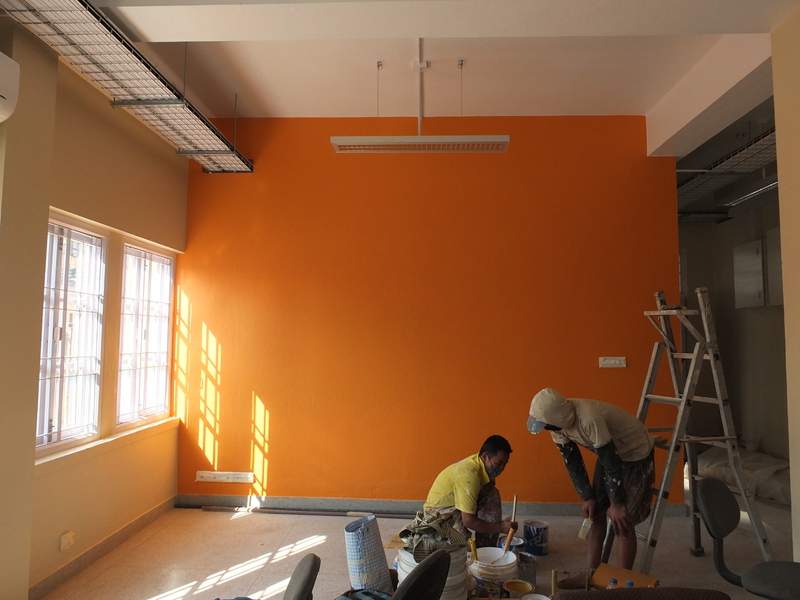 Eventually we picked orange for its energy and freshness. Along with the excellent light, it made the space very cheery and welcoming. This was the condition of the custom built vinyl seat as delivered to me. Not the blue I selected, not the Formica I selected, and covered in dust from sitting around in the factory. It was a very frustrating experience. Ditto with the circulation desk. I took this photo to show just how awful it looked when it was delivered. The formica was chipped and scratched and the whole thing was filthy. There is no recourse. So often there is just no understanding of quality standards – a very challenging part of the project. I kept this picture just for the irony. 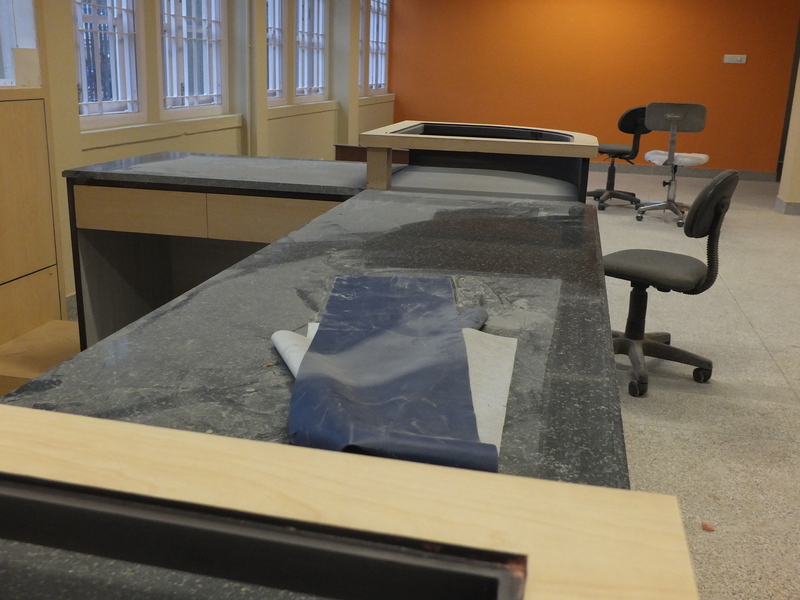 Termites kept invading the library in new spots. I took this photo the day before the earthquake and the next morning a pest control guy arrived with the poison. Two hours later we had a lot more than termites to worry about. …which I was actually doing when the earthquake struck. 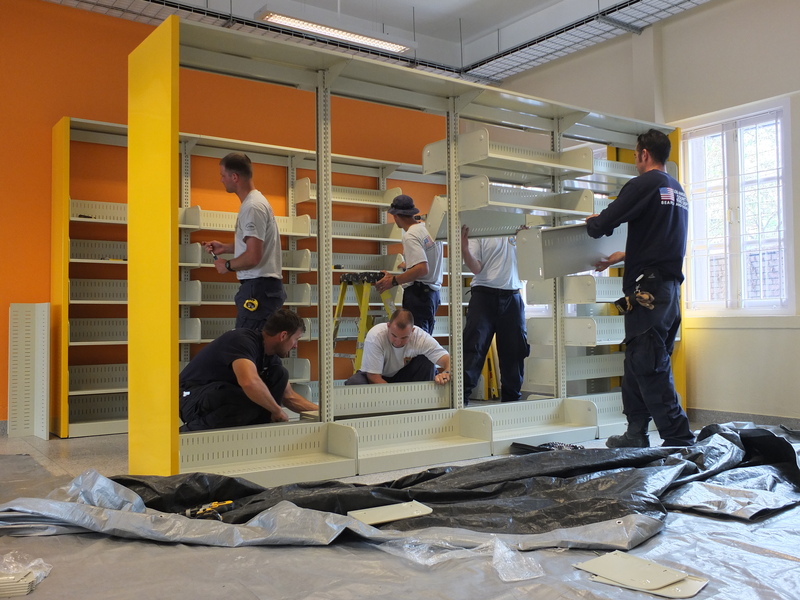 Carpenters were in the middle of assembling metal shelves when they had to run out of the building. The bookcases were not yet bolted down and swayed dangerously next to my ladder. Shelving crashed down everywhere except where I stood on the ladder. I was very lucky. 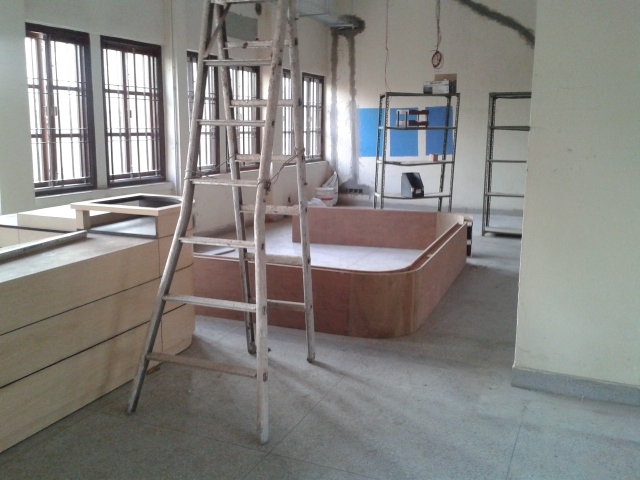 For two weeks, the bookshelves lay where they fell alongside the unassembled units on the floor. 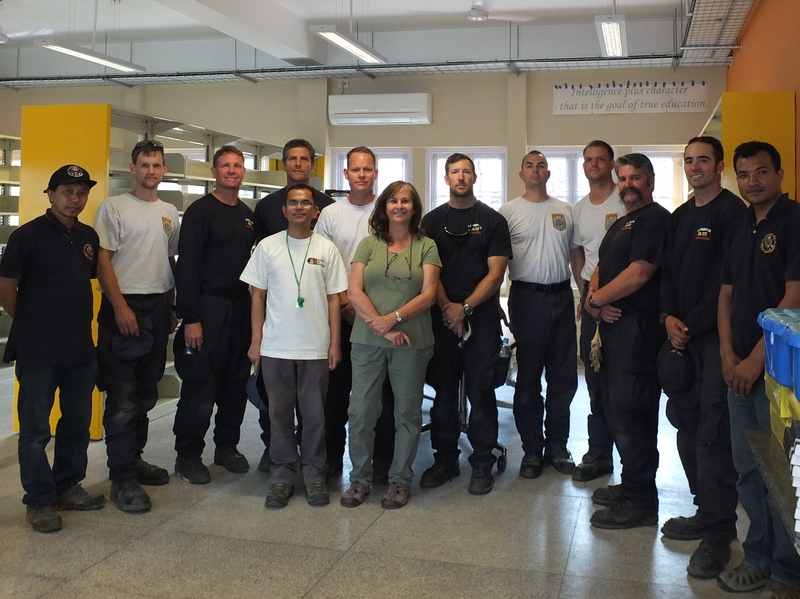 Finally I got help from the USAID Disaster And Rescue Team (DART) who were still in Nepal but with no longer anyone left to rescue from the quake, they came to my aid instead. 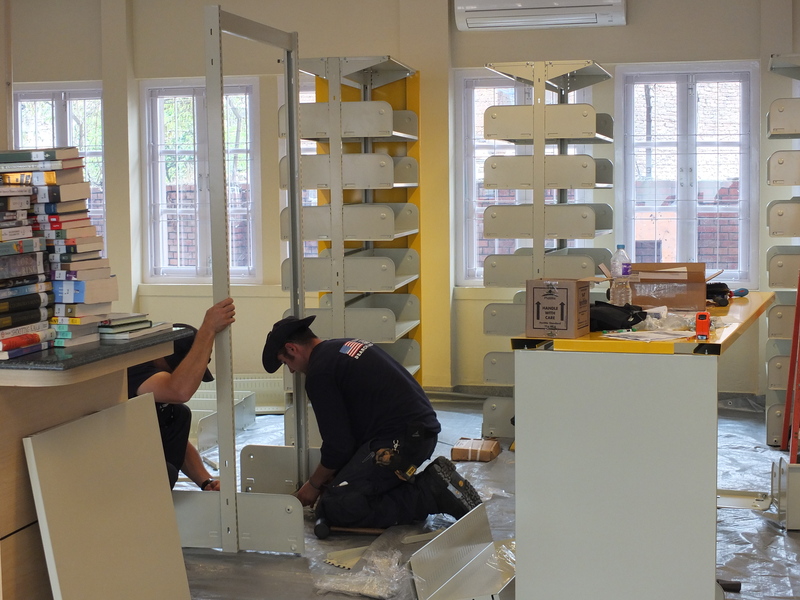 It was so exciting to finally see the shelves going in…. ….and the DART teams guys moved like lighting. And, yes, they bolted the shelves down! 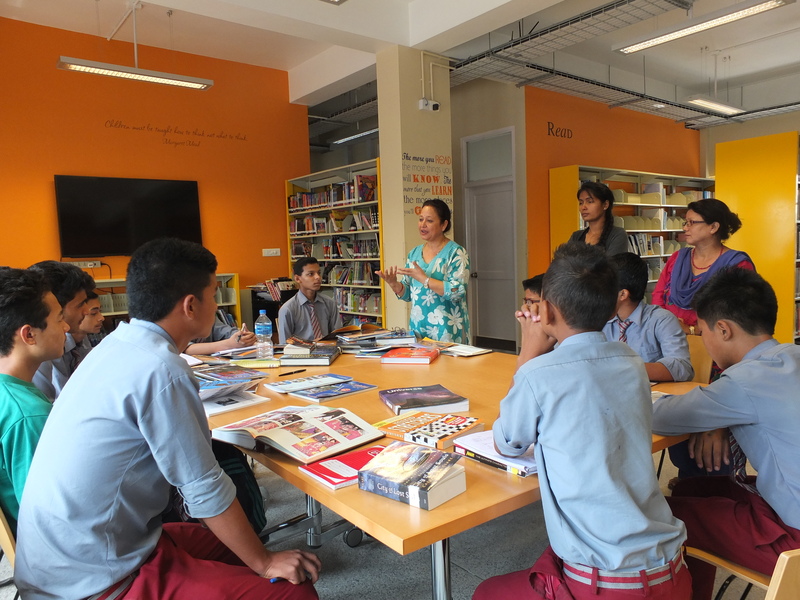 Showing teachers and students around, explaining what the library does and how patrons would be able to borrow books – a pretty new concept for Nepal. 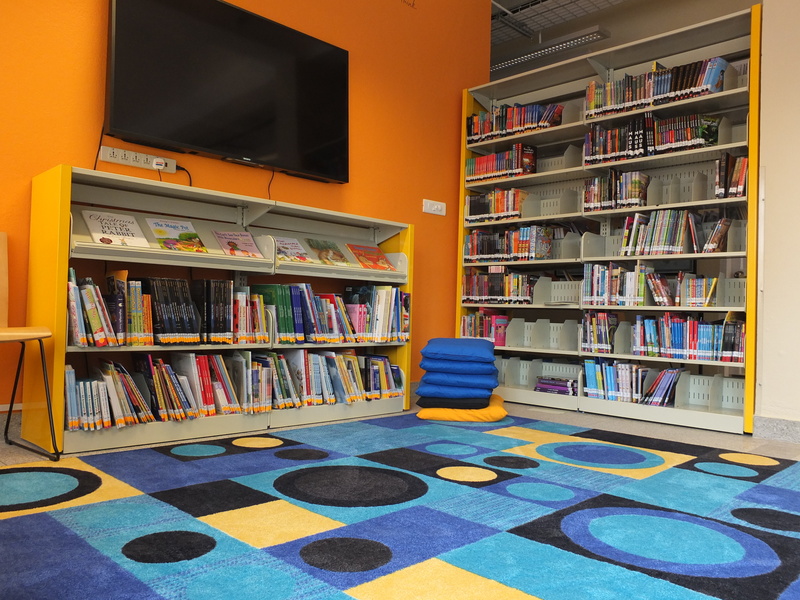 The children’s corner made cosy with children’s picture books, a carpet and cushions. The first group of school kids visited the library. It was pretty special for me to watch them take it all in. 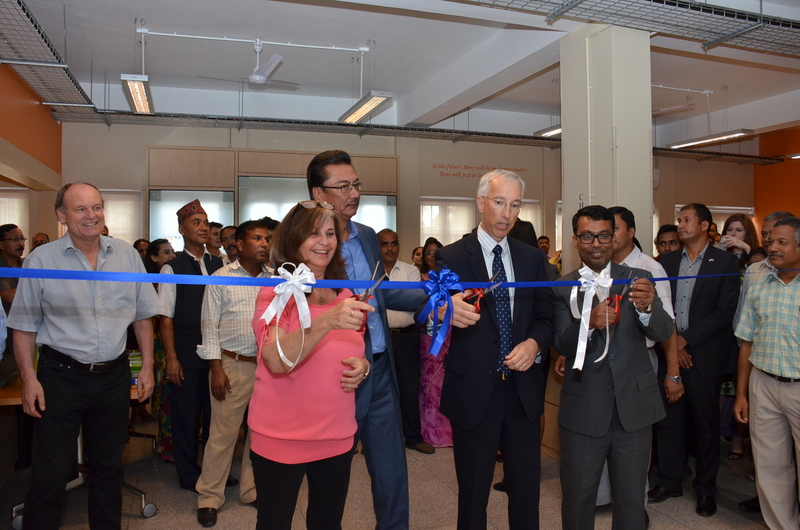 Cutting the opening ribbon about a week before I left Nepal – one month late because of two earthquakes. No bad really! So amazing that we were able to finish it in time. I spent most of my last year in Nepal opening a library. (Post to come on that one.) 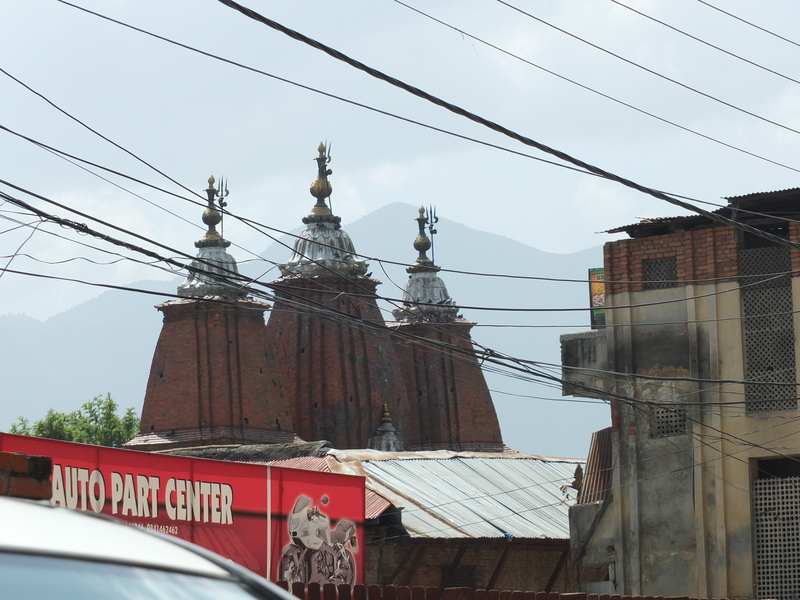 I would arrive at the building in Teku every week for months and would always notice three Hindu temple towers in the near distance. I had no idea what to expect, but wanted to find some time to go over and explore. It was just a few minutes walk away, but work schedules never allowed the time until one weekend –prior to the earthquake– I supervised a cleaning crew before our soft opening. At lunch time the crew headed out to get something to eat, and Kalpana and I went out to explore. Partnered with a Nepali, I got a little braver at snooping around. We struggled at first to find a way in through the locked gate, but we learnt that entrance was long forgotten and another path took us into the heart of the temple. It was a fascinating combination of cared for and unkempt, and clearly was in need of funds for renovation. 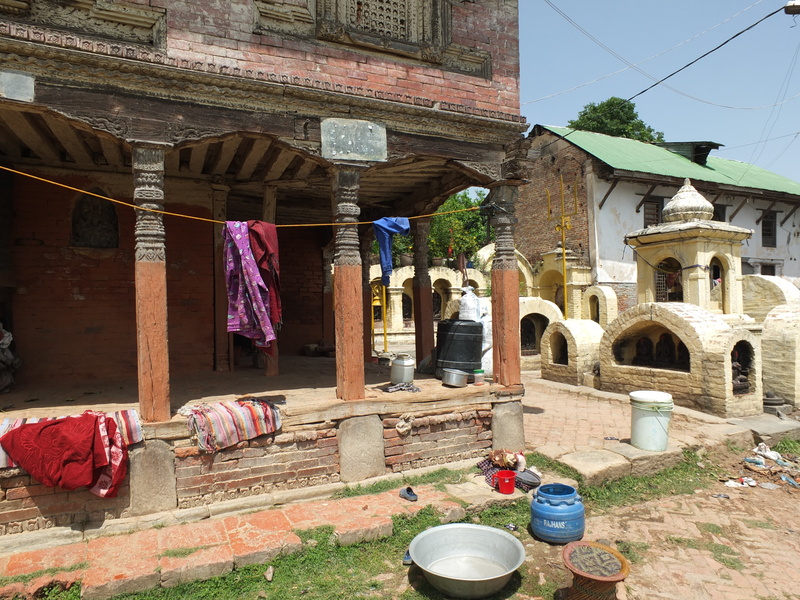 The main temple was boxed in by traditional out houses, laid in a square. I’ve seen them used as meeting halls, schools and storage spaces. 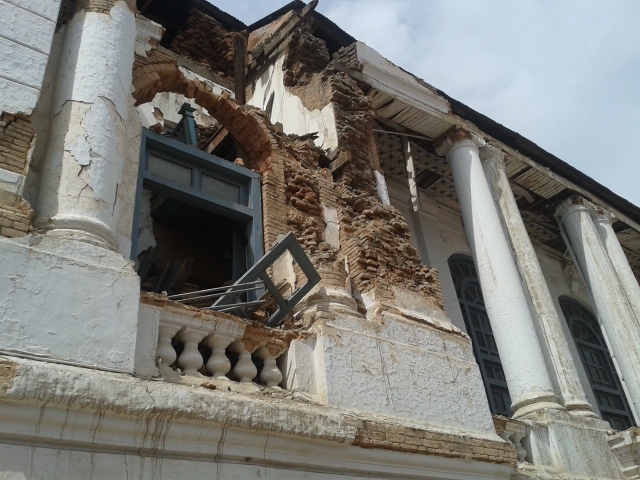 Covered verandas were piled high with old carved beams, stone cornerstones and salvaged religious artifacts. Dog sat caged and barking in one corner and we watched chickens run around in another. Outside the main temple, lanes ran off to the right and left. Overgrown paths led to dirt tracks. 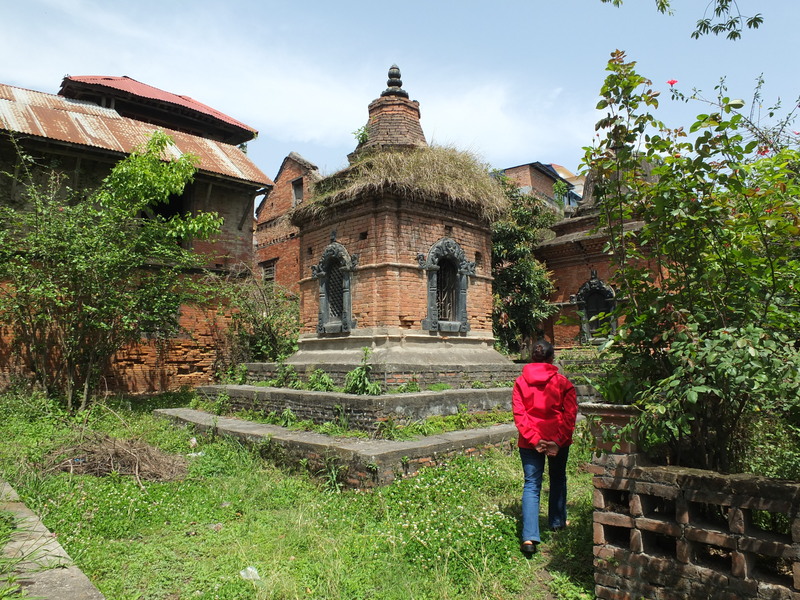 Exploring further, we pushed open gates blocked by weeds or broken hinges and what we found was an amazing labyrinth of temples – small and large, ramshackle homes with laundry hanging outside, and inhabited homes and forgotten buildings…all jumbled together. Some buildings were so tenuously standing that they appears to held together with just one beam. It was like a secret, forgotten place. 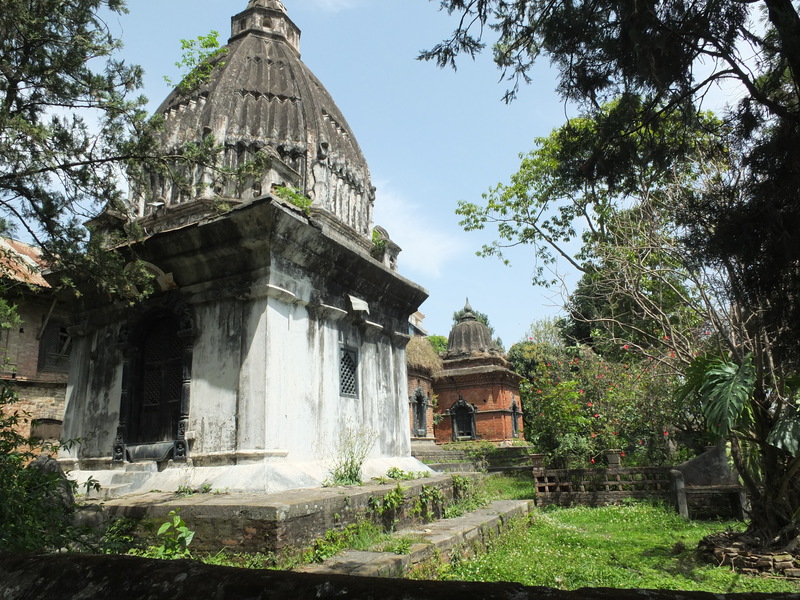 It did seem extraordinary that such a significant site that was clearly of important religious significance had been left to such extensive neglect. Anywhere else in the developed world it would be repaired, groomed and open to the public, the gardens would be kept and visitors would stroll through them with a guide, and locals would sell coffee and trinkets to the tourists. But here the site sat lonely and unnoticed, just five minutes walk away from every day life. It was amazing wandering around the area where everyday life and ancient temples mixed. 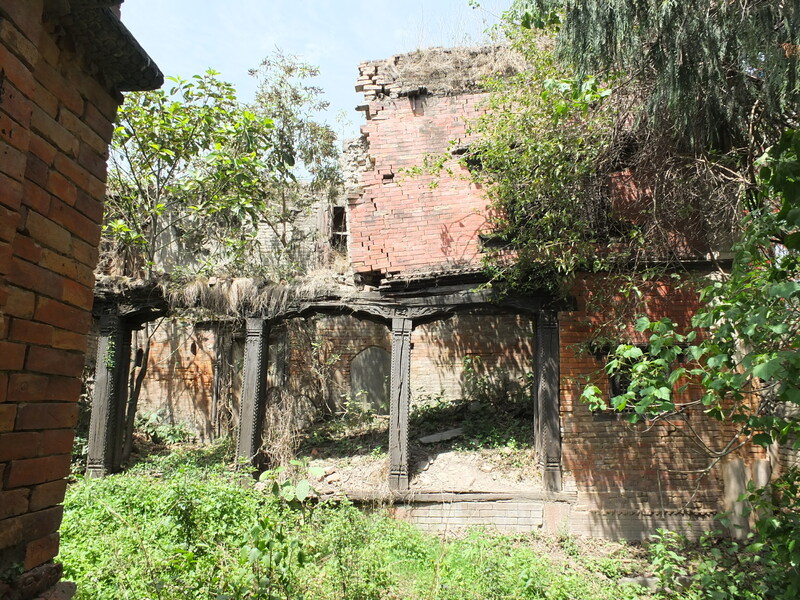 The surrounding courtyard buildings of Tin Deval housed salvaged artifacts, kenneled dogs and chickens. At least half of these buildings are now piles of rubble. We wandered around, exploring all the nooks and crannies. Each one with its own special carvings and detail work…. …like this one for example! Where are they now? Buried under a pile of rubble? I very much doubt that this building is still standing. …and after. How precarious that middle cap looks! How unsalvagable with no crane or equipment! It’s doomed to break. After the second quake. The third temple was clearly damaged also. These were taken down before they fell. 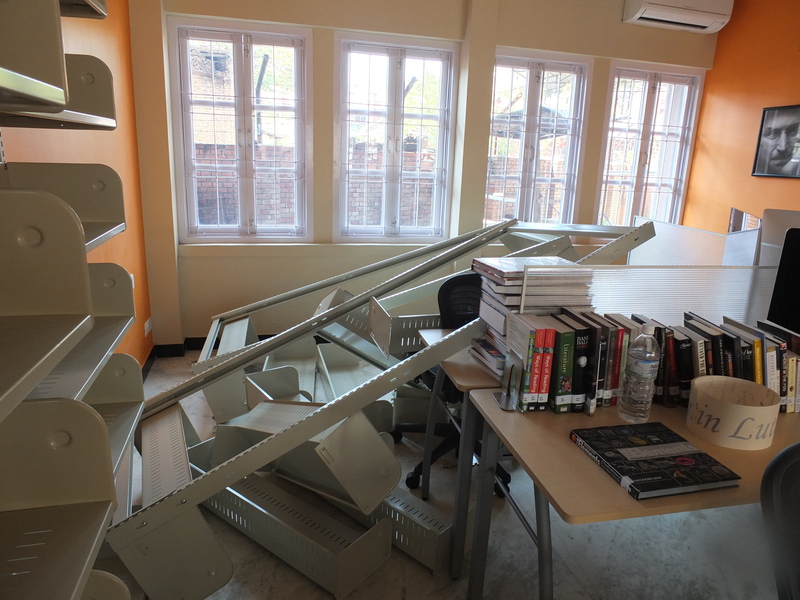 Even though I was in Teku daily during my last month in Nepal, opening the library to the public, I never went back to the site. It was just too scary. The aftershocks meant that it was foolish to wander around in ruins. There was nowhere safe to run. 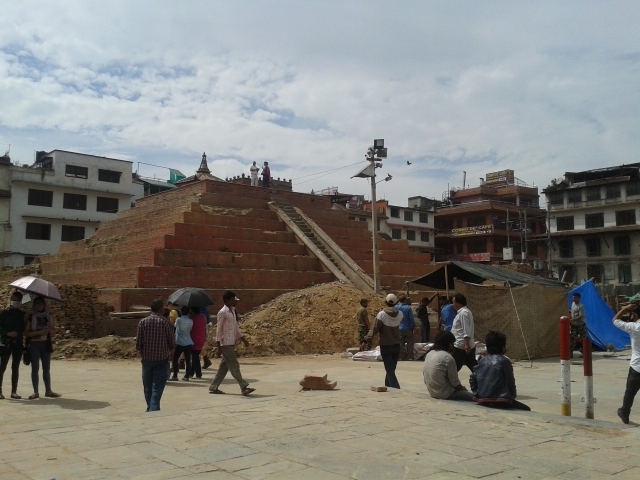 A part of me didn’t want to see extensive damage to a site that I knew would never receive the funding attention that Kathmandu’s famous squares will receive, but I would have gone in the end…just out of respect. I am sure very much of it is gone and it won’t be recovered. I am so glad I at least got to take photos and have captured a little of it here. 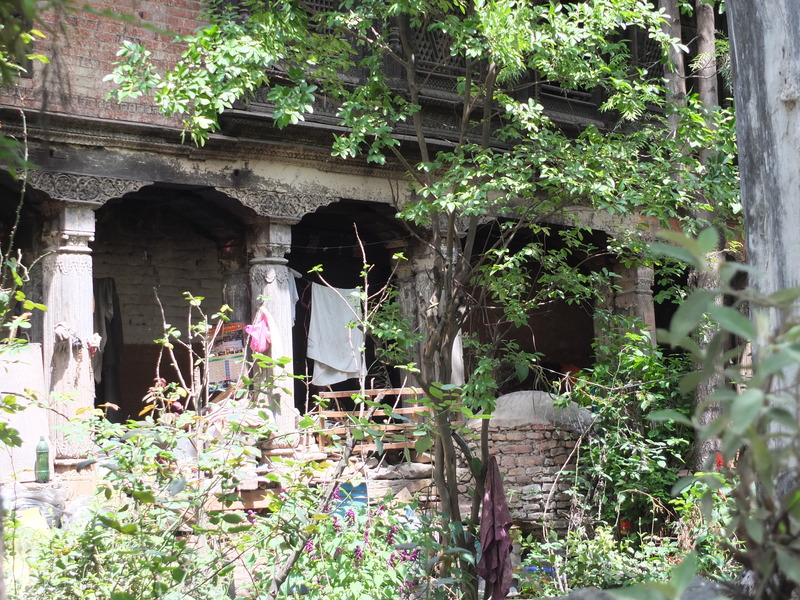 About two weeks after the second quake, I was back in the Kathmandu Dhurba Square neighbourhood searching for a vacuum cleaner of all things… I wasn’t having much success as most of the stores were still closed, as many of the store owners had returned to their villages to help with the recovery. We were about to head back to work when, on a whim, we decided to stop and take a look for ourselves at the devastation that happened at this famous World Heritage site. After the quake and after the rescue squads, in came the clean up crew and stacked the wooden beams and want ever was salvageable from the wreckage (not much). The rest of us just stood and gawped. 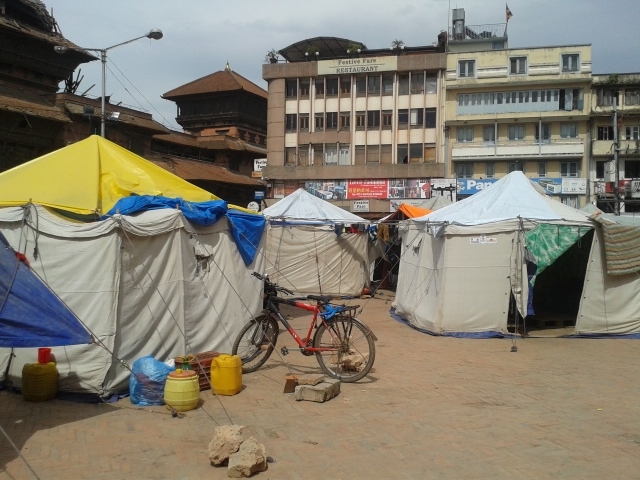 Where tourist vendors previously set up endless stands of Nepalese tourist paraphernalia, now sprung a tent city. 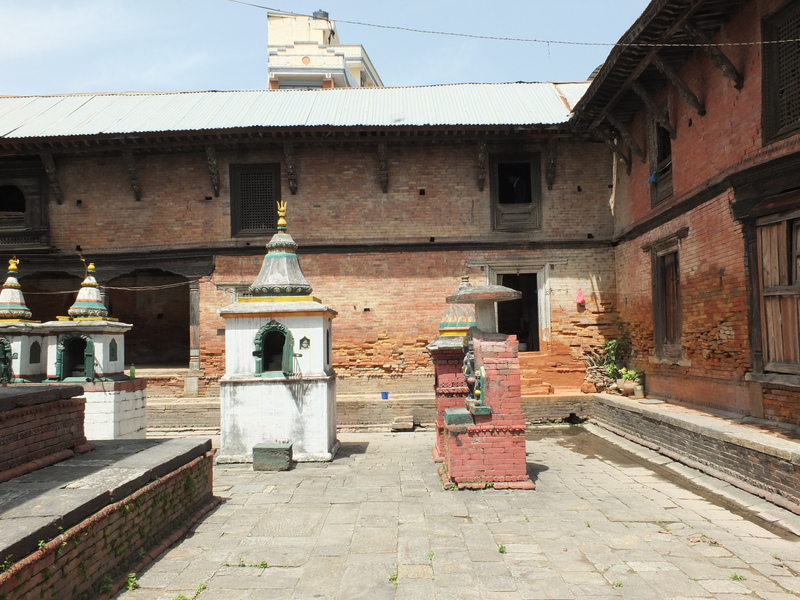 I think international money will come in and rebuild the three Dhurba squares (Kathmandu, Patan and Bhaktapur). However, outside of the World Heritage Sites, so much has been destroyed that will never be replaced. I hope what is rebuilt has a little seismic resilience built into the construction next time around. Its not often that you see a city take shape before your eyes. Manila was that way, with giant skyscrapers flying up seemingly overnight. 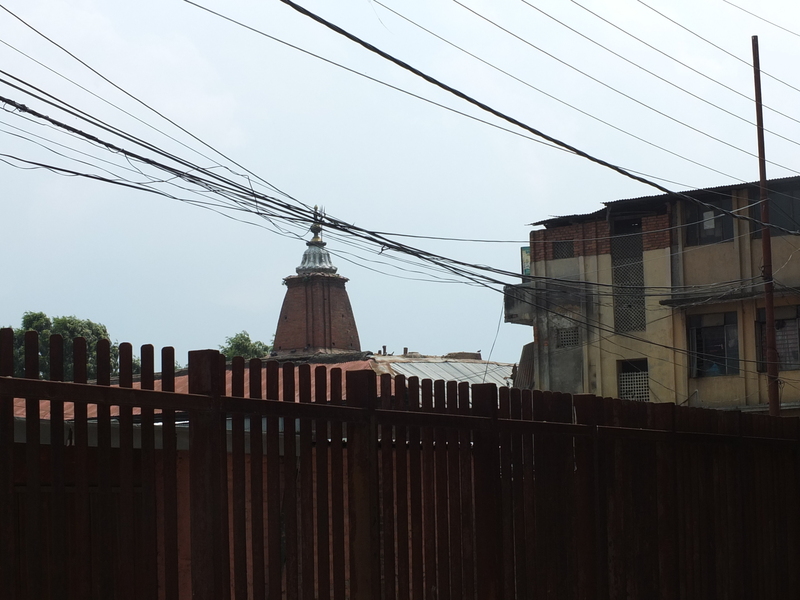 By contrast, Kathmandu builders took years to put up a couple of much smaller multi-story buildings in our neighbourhood. 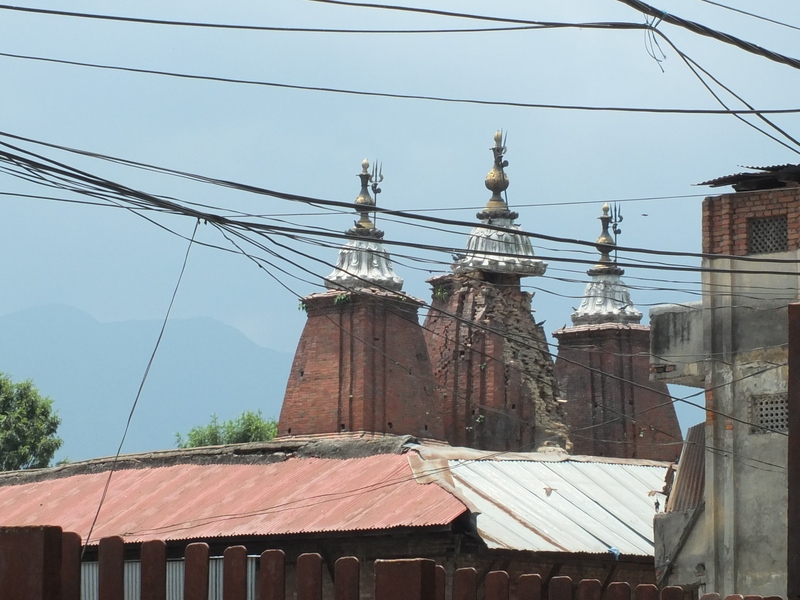 Since the earthquake, the Nepali government stopped the construction of high-rise buildings in Kathmandu. A significant number received a yellow or red card from earthquake damage and the skills and technology needed to implode them are absent along with any conviction to uphold seismic code regulations. What Kathmandu excels in is the construction of two and three story apartment buildings on what was used to be rice paddies. They fly up in the blink of an eye. There’s no seismic code implementation there either, but luckily many did survive the tremors. 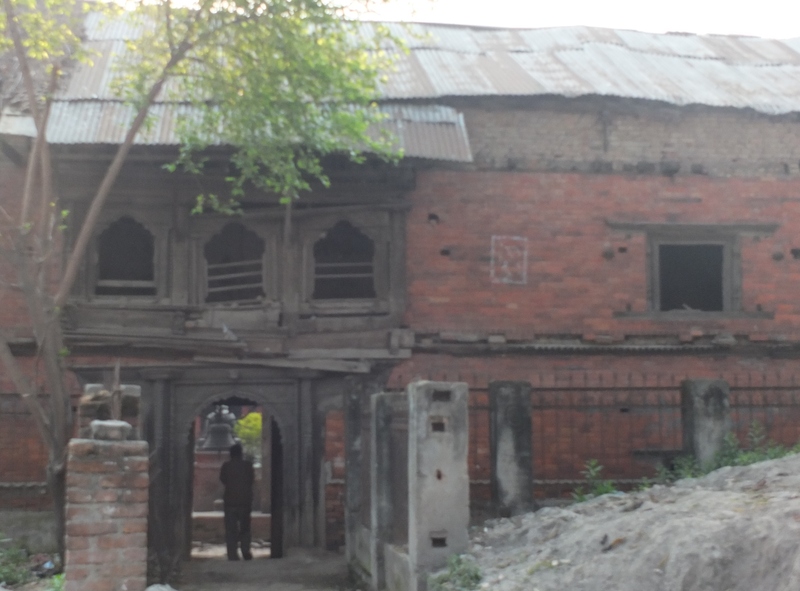 Many older buildings didn’t, especially in the Narayan Chaur/ Nag Pokahari area which was walking distance from our home. Before the quake, the neighborhood was a typical mixture of old and new, but it felt poised to grow, gentrify even. Recent community efforts to upgrade communal spaces with simple outdoor activities and “beautification” efforts continued long after the recent SAARC efforts to spruce up the city. 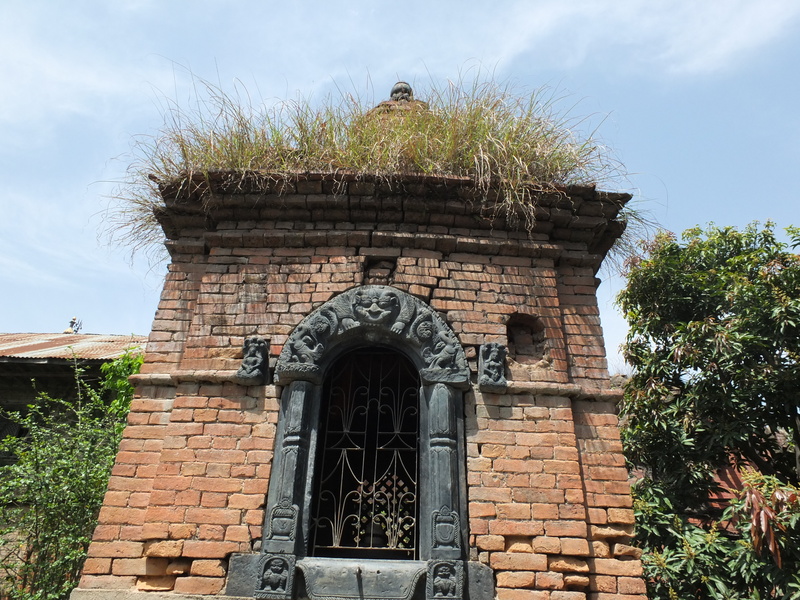 Narayan Chaur, an oval-shaped piece of open land in Naxal, was largely a waste ground and dumping site when we first arrived in Kathmandu. With what in retrospect was surprising foresight, the community police in Naxal developed the barren land into a park and possible rescue point in times of natural calamity. The land was fenced off and a footpath laid out around the perimeter. For a while it turned into a favourite exercise spot for early morning joggers. Clearly, the value to the community was enormous in a city with no parks. Its was a roaring success. 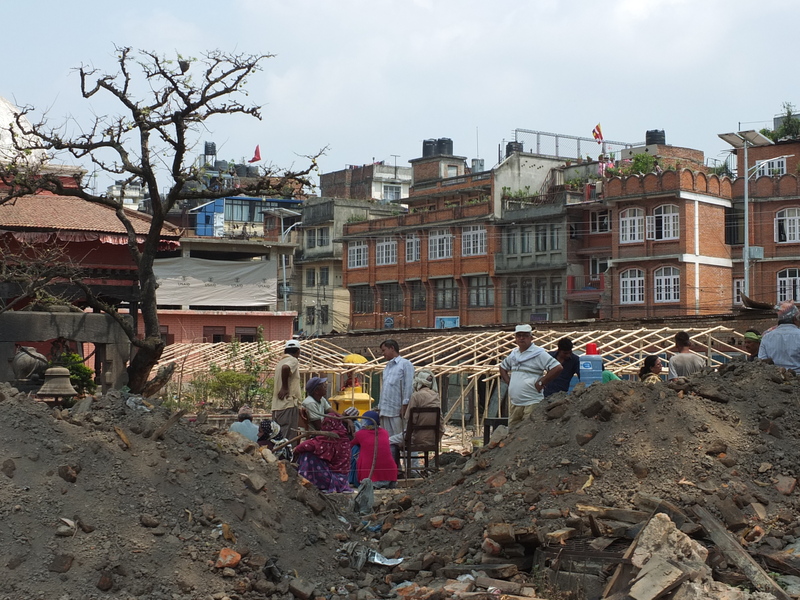 After the quake, Narayan Chaur, quickly became a tent city. I spent about six hours there immediately after the earthquake, sheltering in one of the few, relatively safe open spaces, as the after tremors kept coming and coming. I finally left to walk home, but others are still living there now, almost three months later. Nearby so many old buildings were destroyed. Some were ready to fall anyway, others just ramshackle from years of neglect. I could already see that it was just a matter of time before the old buildings were demolished to be replaced by new, but the hope persisted that perhaps they would survive long enough for someone to come save them. But the earthquake took care of them in its own way, and now there’s little evidence they even existed. 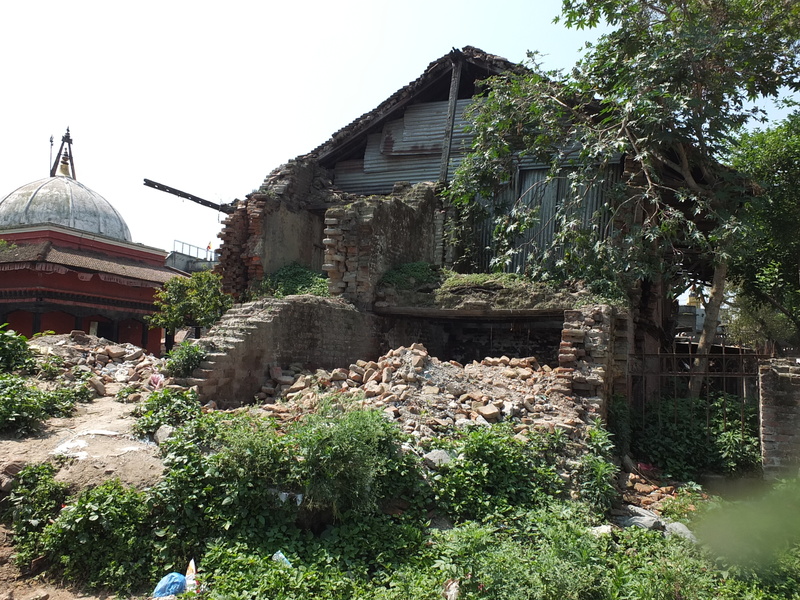 Before the quake, the ramshackle temple at Nag Pokhari housed a school also. 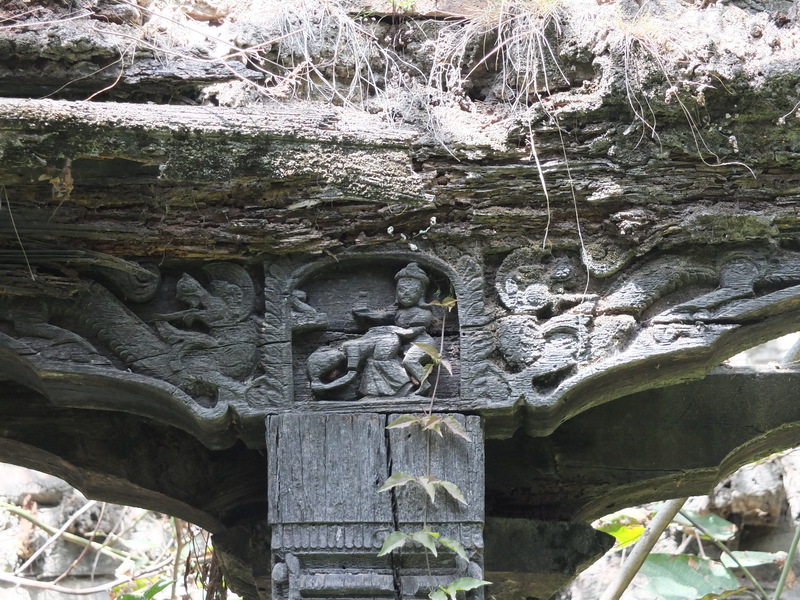 Its almost dilapidated buildings showed wonderful traditional architecture and carving. There was no option left but to demolish it. A temporary school building is being constructed among the rubble from international humanitarian funds, which is much needed. But so much history is gone. This week’s Weekly Photo Challenge: Doors is an opportunity to feature Nepali doors – plain and ornate. I may have just left, but I think I’ve many a Nepali post still to come! 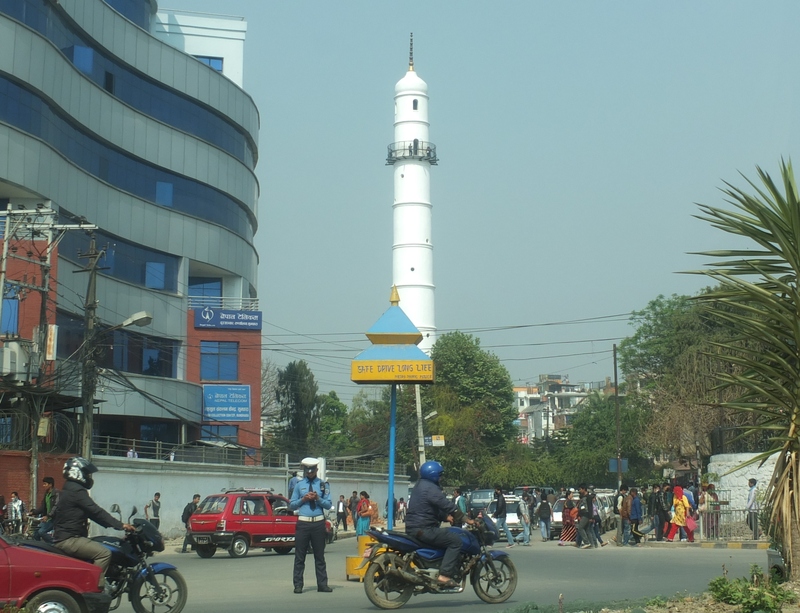 This is a photo of Bhimsen tower, also known as Dharahara, which I snapped a couple of weeks before the 7.8 Earthquake on April 25. In the immediate hours following that terrifying day, the tower was the first casualty of the quake that we were learned about. The numbers of reported casualties from the tower’s collapse vary enormously from 50-200 dead, but one this is for sure… although the quake’s occurrence on a Saturday was a blessing in so many ways, this wasn’t true for the tower. I imagine that lunch time on a Saturday was peek visiting hour on everyone’s day off. I never went up it and never seriously considered planning to go. I’m not claustrophobic, but I don’t like crowds in small places and the idea of climbing nine stories in a cramped space was very unappealing. I’m sure the views were terrific though. Now when we travel through the center of town — which has been 2-4 times daily for me recently – my neck cranes to see the landmark that is no longer there. It reminds me, of course, of the twin towers and how the New York skyline is changed forever with their absence. In the middle of the heavy flow of traffic, on a traffic island that’s really just a scrap of land, an artist has recently erected a four foot replica of the tower, as an attraction and reminder to passersby. I wonder how long it will take them to rebuild the real thing? Five Days/Five Photos Day 4: Spot the Difference! This is a photo of a photo, taken at the Climate Plus Change exhibition in Kathmandu last year. 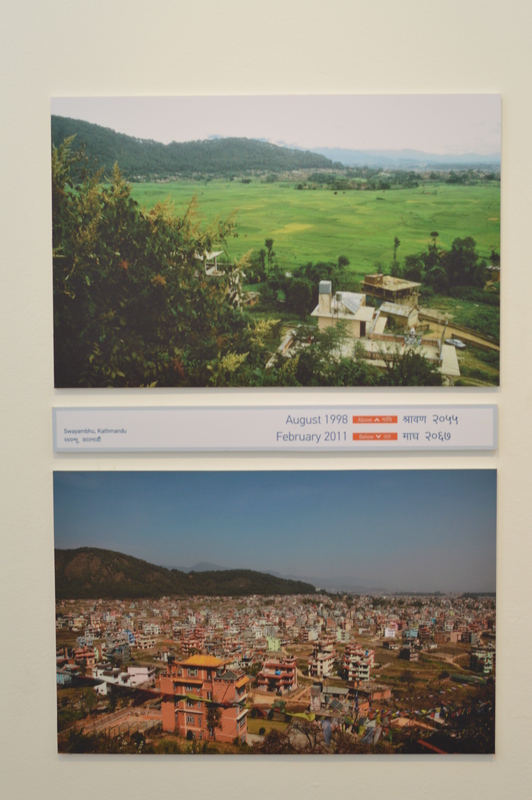 Among the collection of poignant, climate-related photography, this exhibit showed a number of before and after pictures taken inside the Kathmandu Valley, documenting the developmental changes over a relatively short period of time. Can you actually believe that this is the same scene across just 13 years? The only real clues are the shape of the background hills and a small building at the right-hand foreground of the picture. Truly unbelievable. I have been here two years and I know that the sprawl continues to grow, probably at the same rate, its just harder to see when it occurs incrementally around you every day. Its been four years since the lower picture was taken and the Swayambhu area now has literally no patches of green, other than the hill that overlooks it. All this sprawl is in unchecked, unplanned, and unsupported by any growth in roads or services. Its a sad reality. 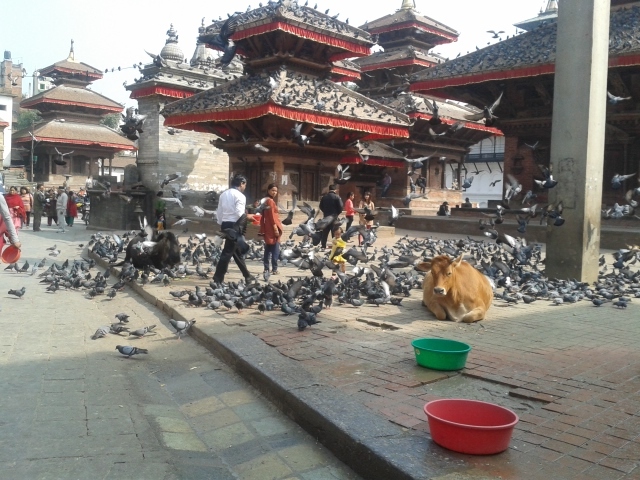 I lived in Kathmandu for several weeks before I spotted public transportation. The white taxis and micro buses were invisible to me. Maybe they just faded into the background behind the colour and confusion of everything else. Maybe my eyes were still trained to see the bright colours of Filipino jeepneys. I’m not sure. But slowly they came into focus; there they were: plain, white, rickety and very small. The idea of a Jeepney ride always seemed more fun than it actually was, as Jeepneys face inwards and there’s no view. But their colour baits you, which is actually the whole idea behind their outrageous designs. 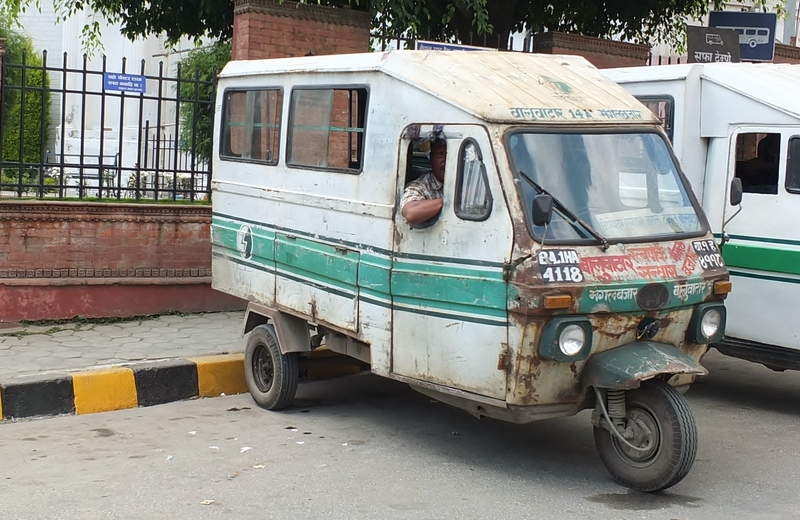 By contrast, the idea of riding in a Kathmandu microbus seems no fun at all. I can’t imagine actually cramming myself into one. Where would I put my legs? My head would scrape the ceiling. It wasn’t until much later that I spotted the microbuses were all electric vehicles or EVs. It was a shocking revelation in a city that pays little attention to pollution or lead levels. It was later still that I learnt that EV microbuses were a USAID-supported innovation from a while back….of course. Despite the rust and hanging exhaust pipes they are still on the road. They may be the Jeepney’s poor cousin, but whatever would Kathmandu pollution levels be like if they belched carbon too? On the dusty sidewalks, inches away from the busy traffic, there exists a kind of alternative consumer reality here. Street vendors are not starter businesses that aspire to work hard and some day afford the rent on a store. They are Dalits (or untouchables) who do not have many rights (including the right to rent property) that higher castes hold. There is a whole world of fruit vendors, cobblers, barbers –sales people of anything really–who set up for business on the side of the road and sell what they can to passersby. I suspect mainly to other Dalits. I’m ashamed to admit that I rarely buy from them. They simply never sell anything I need, or their produce is so covered in roadside dust and grime that it is very unappealing. Yet I see the same vendors time and time again selling paltry little piles of something every single day, clearly enough to eek out some kind of income. Its the fruit vendors that are the most eye catching with bursts of colour against the grey drabness of the pavement. 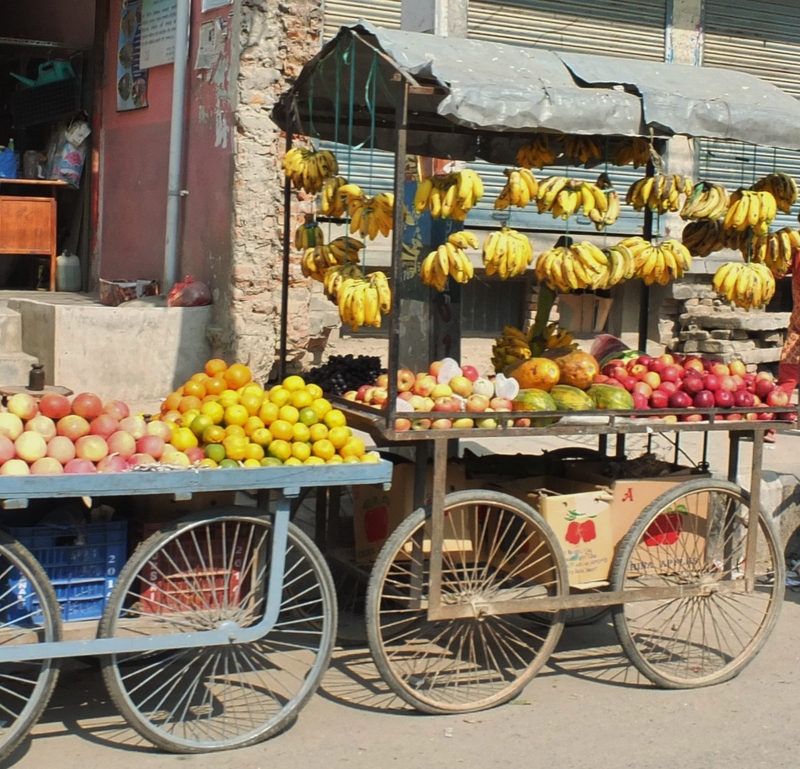 Seasonal bananas and mangos from Nepal…grapes from India…apples from China. I particularly enjoyed these colourful carts. 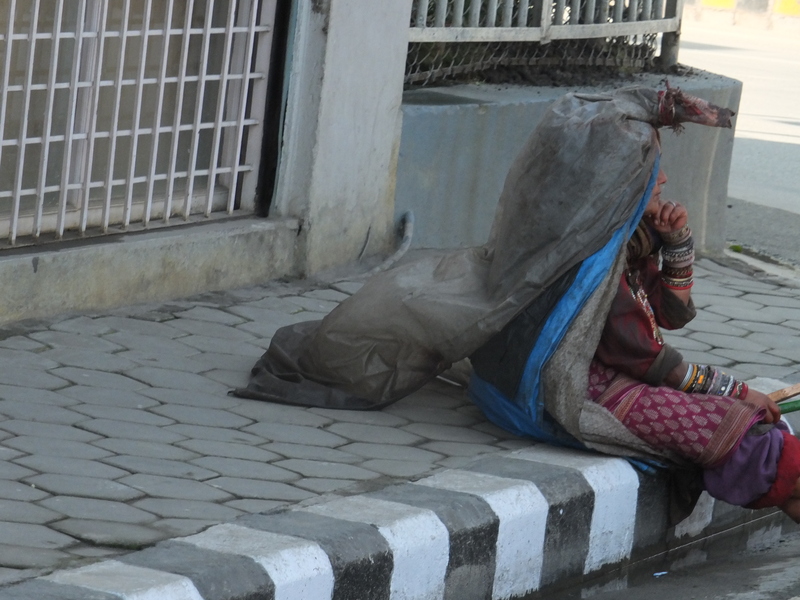 All through the late rainy season and into the winter cold, every morning when we left our gate we saw this homeless lady. Huddled up in many layers of clothing – including the distinctive fabric and apron of Tibetan clothing — she became a fixture in our community. She had fashioned a head protector from a rice sack, which she wore continually for cover from the sun and rain, and probably the cold too. It gave her a distinctive, almost dignified appearance. I think she must have slept in the little park on the corner of our street, or perhaps on the pavement itself. I’d often see her huddled against a wall or near a local restaurant’s window, warming herself on the heat from the ovens. I got the feeling that the local shopkeepers took care of her with food and water, but most of the time she just hung around, waiting and watching. She would turn up unexpectedly on the kerbside, or on the distance I’d see her distinctive profile curled up in a squat. It can be hard to tell the age of weather-beaten faces but I think she was fairly young. What was her story? Why was she homeless? As I was trying to take a picture from our car of another subject, I unintentionally took this picture of her instead. She just unexpectedly showed up in my viewfinder. Then, just as unexpectedly, one day she was no longer around. I wonder what happened to her? Wandering Cows challenged me to the Five Photos, Five Stories Challenge which requires you to post a photo each day for five consecutive days and attach a story to the photo, then nominate someone else. This is my first entry. I would like to nominate Alex from She Gathers No Moss, who write engaging vignettes from the Philippines and makes me homesick for my time there.